Financial Technology, or FinTech, has become a common term in industry circles as well as in an increasingly tech savvy world. 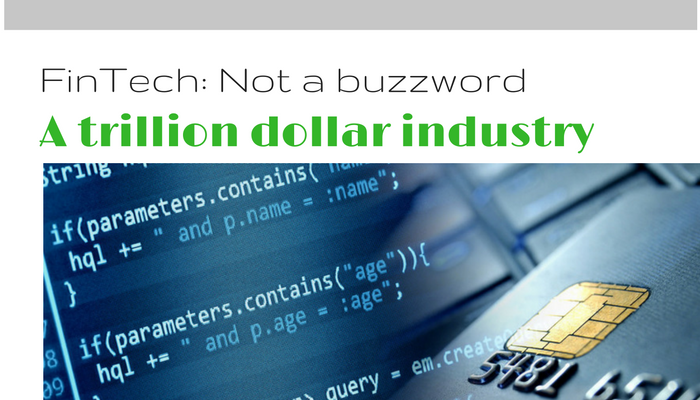 While the term itself may be trending, be sure that it is more than merely a buzzword in a tech sector that is constantly filled with buzzwords. The FinTech market has been growing in leaps and bounds since 2012. Global investment in financial technology nearly doubled from 2012 to 2013 from 2.6 billion to 4 billion dollars in one year. That, however, was just the beginning. Global investment in FinTech lept from 4 billion to 12.2 billion in 2014. According to Forbes, it was a 38-billion-dollar market in 2016, and an Accenture projection for 2017 estimates the FinTech market to grow by another 8 billion in Q1 of 2017. Forbes also reports that in 2016 the number of established Financial Technology companies surpassed 1,000 with those companies receiving a gross valuation of $867 billion. That same research projects another 2,000 FinTech startups will emerge in the next year. This is a staggering growth rate even for a technology sector were growth can sometimes come quickly, but also peek and decline just as quickly. The major reason for this rapid growth is a banking industry that has traditionally been resistant to disruption. With a solid economic model and the general movement towards deregulation in the banking industry over the past two decades, big banks and established financial firms haven’t seen the need for market disruption or major technological innovation. But as we turn to a global market more so now than ever before in our past, an industry that was once happy to stand pat, is now ready to branch out. Too often FinTech is thought to be solely utilized and driven by the banking industry. And while this is certainly a major factor in the pace of growth the FinTech industry has seen, it is far from the only factor. Nor is it a sector that only pertains to the back-end operations of financial institutions. A more modern and applicable definition of FinTech is usually applied to the segment of the technology startup scene that is disrupting sectors such as mobile payments, money transfers, loans, fundraising, asset management, and even financial security. As these six markers indicate, the FinTech industry is moving towards and more typical, and consumer-based approach to market. Trying to hit those markers ourselves, we here at NOCHALLENGE Technology have also become active in the FinTech industry. Our self-prepared tax software is a disrupter in the Bangladeshi tax market, acquiring over 4,500 users in the 30 days leading up to the local tax season. We will also be deploying a complex custom software piece to help a major cyber security firm manage and mitigate cyber risk to their banking customers. To find out more about how NOCHALLENGE will be deploying our services and expertise in the financial sector, or for more information on how our technology solutions can be of service to your financial institution, contact us today.